The Legislature finally adjourned after a 20-day special session to conclude work on the state’s supplemental budget. As the lead budget negotiator in the Senate this year, I worked to ensure a sustainable and responsible budget that would allow us to live within our means. I believe we accomplished those goals with the budget we passed. The final agreement meets the requirements of Washington’s 4-year balanced budget law, preserves the rainy day fund, and refuses to go back to the irresponsible budgets of years past. This is in contrast to the original proposal from House Democrats that drained the state’s rainy day fund, reduced K-3 class-size spending by $500 million, and proposed news taxes to pay for new state programs. Instead, we continue our investments in K-12 education, fully fund historic tuition cuts, and improve treatment for our state’s most vulnerable including the disabled and mentally ill. We said no to higher taxes and insisted on a sustainable budget with no gimmicks. Unfortunately, some of our work was undone when Governor Inslee vetoed several cost-saving measures in the budget before signing it.The result was the loss of over $200 million in cost savings. The governor’s vetoes undercut this work and will make our job building a balanced two-year budget next year much more difficult. I firmly believe that without the influence of the Senate Majority Coalition, the future of our state would be much different. Over the past four years, we have brought needed discipline to our state’s budgeting process. We have consistently lived within our means, funded our state’s real priorities such as education and our most vulnerable, and held the line on new taxes. In addition to working on the state’s budget, I had the opportunity to sponsor a number of bills aimed at improving our state and local community. Several of these bills were requests from constituents and local businesses who have already experienced benefits from this legislation such as changing the way the state provides industrial insurance for students and volunteers as well as expanding access to mental health services by allowing qualified physician assistants to deliver critical services. Click here for more information on bills that I have sponsored. I have also been developing a policy newsletter, called “Economic Sense,” that takes an in-depth look at issues facing the Legislature. Please take a moment and read highlights from the latest editions and visit my website for more information. The Senate Majority Coalition Caucus has tried twice to give voters the opportunity to make the popular two-thirds majority tax-vote rule part of Washington State’s constitution, where it would be safe from judicial or legislative interference. Senate Democrats have stood in the way, saying it would allow a minority of legislators to block the actions of the majority. SJR 8215 offers a compromise resolving the Senate minority’s concern, while ensuring voters have a say before tax increases are enacted. Pension liabilities and debt service are the fastest growing areas of the state budget, costing almost $4 billion together. This is more than the combined state support of the mentally ill, those with developmental disabilities, nursing homes, early learning and the UW & WSU. These costs are putting our ability to provide essential services at risk. Reforms are needed to ensure taxpayer dollars are not consumed by long-term debt service and pension liabilities. During each legislative session I take an in-depth look at significant economic policy issues. The most recent edition of my “Economic Sense” policy paper concerns administrative rule making. My legislative proposal will rein in executive agencies that have increased the number of rules, which have the force and effect of law, by 38 percent over the past decade. The Washington Administrative Code (WAC) now contains 22,000 pages of rules that impact every aspect of our lives. The problem is that those rules are made by unelected and unaccountable agencies with minimal input from the public. My bill, SB 6396, will require all new rules to automatically sunset the year following their enactment unless legislative action is taken. 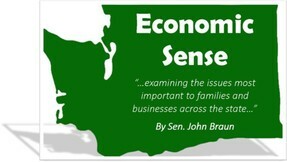 Click here to read this most recent edition of “Economic Sense” and take a look at my website to catch up on previous editions on topics ranging from state employee compensation to higher education. You received this email report because you are a 20th Legislative District resident. Under election-related rules, Senators who are up for re-election later this year – including me – are allowed to send two e-newsletters to those who have not actively subscribed to them. If you wish to continue to receive additional updates you must subscribe. I hope you will take a moment to sign up so I may provide you with more news about your state government. Just click on the link below. Due to those restrictions this will be the last communication you will receive from my legislative office until after the 2016 elections. It is an honor to serve as your state Senator. Please do not hesitate to reach out to my office with questions or concerns regarding your state government.